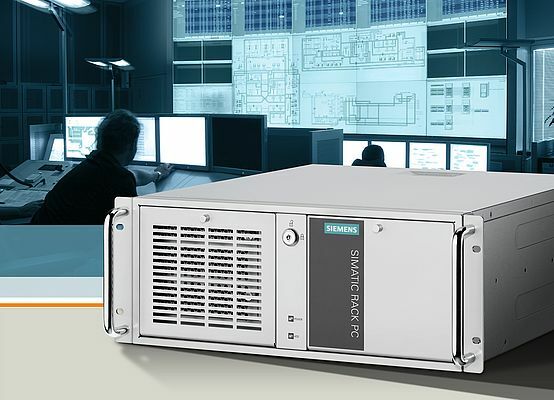 Siemens is launching a range of rack PCs on the market for the low-end price segment for industrial PCs. The Simatic IPC347D industrial PCs are particularly suitable for the production environment where greater robustness is required compared to office PCs. With this new product line, Siemens is primarily addressing the price-sensitive sectors and markets in machine and plant construction. The new 19" rack PCs in a rugged metal enclosure are available from stock in four fixed configurations. These differ in terms of processor type, RAM configuration, optical drive and operating system. Customers can select Intel Pentium Dual Core G2010 or Core I5-3340S processors of the third generation, 2 or 4 GB of RAM, DVD-ROM or DVD-RW drive, as well as a preinstalled and activated Windows 7 Ultimate 64-bit operating system. The Simatic IPC347D rack PCs are ideal for visualization tasks, data capture, management and storage, plus measurement and testing tasks, for example, in building and process automation, logistics and mail order, as well as medical technology. They are equipped with 500 GB HDD hard disks and a variety of interfaces - including six USB ports and Gigabit Ethernet ports. The units offer flexible expansion options thanks to seven free slots of various PCI formats. Like all Simatic IPCs, the new rack PCs are designed for 24-hour continuous operation, even when exposed to tougher temperature, vibration, shock, and EMC. The 3VA series by Siemens will renew the Sentron portfolio of molded case circuit breakers for low voltage power distribution. The new, more compact circuit breakers are available in a variety of versions up to 630 A, and represent a particularly space-saving solution. New are the integrated metering function, a switch disconnector version, and MCCBs with a side wall mounted rotary operator. An online product configurator and twelve downloadable CAx data types, including 3D models and EPLAN macros, help facilitate the engineering of the protective devices. The 3VA series comes with over 500 accessory components for a modular configuration meeting virtually any requirement, plus more than 70 additional functions. MCCBs protect electric lines and electric consumers, as well as entire industrial systems in buildings and industrial facilities from damage and failures by safely disconnecting the power supply in case of faults like short-circuit or overloads. With the Sentron 3KD series, Siemens has enhanced their portfolio of switch disconnectors for low-voltage power distribution. The new devices can switch higher currents up to 1600 A, and are available in five model sizes in three- and four-pole versions each. They will offer improved user protection against electricity-related accidents during installation and maintenance work, and prevent incorrect operation. Various operating mechanisms (front or side panel rotary operating mechanism) and increased flexibility in terms of function expansion make the new switch disconnectors suited for use in industrial production facilities, buildings, and photovoltaic systems. The switch disconnectors comply with the standard requirements of IEC 60947-3 for low-voltage switchgear and controlgear, and with device-specific EC directives for product safety. They are suitable for use in AC and DC applications.